Ideally, i'd like to have GmusicBrowser laid out like this (click for larger). Problem is; I can't make much sense of the code for layouts, so i'm here asking for help. Perhaps someone is feeling kind enough to modify the layout 'Playlist, Library & Context' to resemble my mock-up? 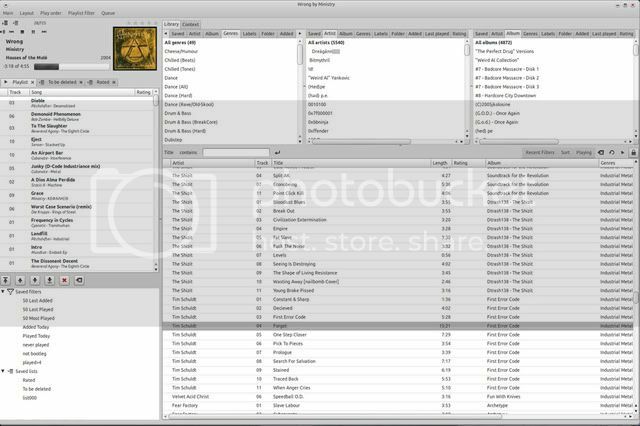 Modify layout 'Playlist, Library & Context' to include the filter list below the Playlist. Add playlist tabs to the top of the playlist. I suggest putting it in a separate layout file (e.g. ~/.config/gmusicbrowser/layouts/custom.layout) so that it wouldn't mess with future updates. And, of course, the layout won't show up until you restart gmusicbrowser. Going back to the original layout, would you mind simply adding another filter pane and remove the context tab above, please? On consideration, it's probably a better idea. The leftmost filter pane controls playlist.